In the previous article, I discussed how bringing a psalm sheet to chant at the ambo has its challenges. So, I've devised a way that helps me discretely carry the psalm lyrics sheet. This method allows me to keep the copy in my pants' back pocket without it getting crumpled until I'm ready to bring it out. In this method, you'll need to fashion a clear plastic sleeve or jacket where you can insert the psalm lyrics sheet. You only need to prepare this item once as it can be reused many times over. Find a suitable plastic sheet or jacket depending on your size requirement. It is important though that the sleeve is roughly the same dimensions as your palm. In my case I used an old passport plastic sleeve or jacket. My purpose was to keep the sleeve as large as possible without it being too obvious in my hand. Alternatively, you could use an old ID card or credit card jacket. Any ID card case or plastic jacket is a likely candidate for this purpose. Shown below is the plastic sleeve I cut from an old passport jacket. The plastic sleeve shown above measures 70 mm x 115 mm. There are plastic card cases or (or plastic jackets or plastic sleeves) of similar sizes that can be bought for cheap. After printing the psalm sheet, fold the psalm sheet at a logical point (start or end of a verse). Be sure the flaps are evenly spaced so the folded sheet should easily fit into the plastic sleeve. Here is the psalm sheet neatly folded and inserted into the plastic sleeve. Note that before I printed the psalm sheet, I've edited the file to put the date on top. This just reminds me that I have the correct psalm to chant for the day. This side of the psalm sheet shows the psalm response and its musical notation to be played by the choir. The music notation serves as a guide in my singing of the psalm response. Shown below is the reverse side of the psalm lyrics sheet inside the plastic sleeve. Notice the annotations I made to aid in my chanting. I drew diagonal blue lines to indicate pauses and change of chant tone. You could actually add more of these notations to aid you in the chant. To continue with reading and chanting through the verses, I simply flip this psalm sheet - no fumbling of turning pages. At the start of the procession, simply put the plastic sleeve with the psalm sheet in your pants' back pocket. When it's your turn for the First Reading and Responsorial Psalm, inconspicuously pull out the plastic sleeve from your pocket. Place the plastic sleeve with the psalm lyrics sheet on your right hand palm as shown below. Notice the sheet is just big enough to be concealed inside the palm. 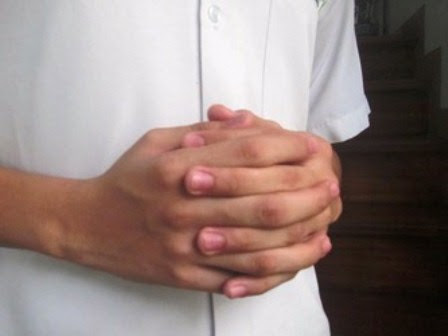 Position your right hand at your front and move your left hand towards the right hand. In the photo below, I'm clasping my hands with the psalm sheet hidden from view. Here's a photo taken over my shoulder. Notice the plastic sleeve is not flat on my palm but is rather curved or rounded. It is much easier to grip the plastic sleeve this way. Here is how the congregation would most likely see my hands secretly carrying the psalm lyrics on my way to the ambo for the First Reading. See, there are no loose sheets and the plastic sleeve protects the psalm lyrics inside. 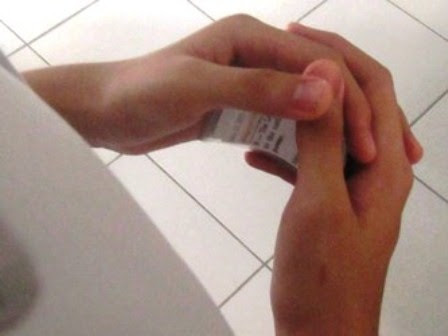 It is discrete way of holding the plastic sleeve much like the normal prayerful hand clasp as shown below.